(Movie Trailer) The core of human nature, I think, is based on empathy and compassion. It's extremely rare to find someone that does not empathize in some way or form naturally. The Dalai Lama said it best, it's not a religious thing, it's not a political idea, this is the way we are born, this is in our blood. 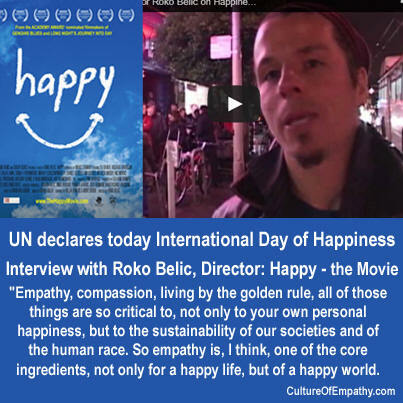 Empathy, compassion, living by the golden rule, all of those things are so critical to, not only to your own personal happiness, but to the sustainability of our societies and of the human race. So empathy is, I think, one of the core ingredients, not only for a happy life, but of a happy world. 'The core of human nature, I think, is based on empathy and compassion. It's extremely rare to find someone that does not empathize in some way or form naturally. The Dalai Lama said it best, it's not a religious thing, it's not a political idea, this is the way we are born, this is in our blood.